Brahma and Vishnu share a unique relationship in the Puranas. Brahma is said to have been born out of Vishnu's navel. Sri or Lakshmi is also said to have been born out of Vishnu's navel. Vedas and Puranas say Maya covers the whole Universe. They say Maya is the feminine form of Vishnu. They say it is the maya that masks us from discovering from what is behind. We are all in the Maya and what we see is Maya. It takes a great amount of intuition and intelligence to go and discover what is behind Maya. What is behind this Maya is Brahma, Vishnu and Siva. If Brahma is Gravity, Vishnu is Inertia, then Maya is the 'Rest-Mass'. The rest-mass covers the whole Universe. The mass is manifestation of other forces like Gravity, Inertia and Energy. But they are all covered by the rest-mass and we observe only the rest-mass. If we go behind the rest-mass, we observe Gravity, Inertia and Energy as the sources that cause the Rest-mass. But Vishnu is not just the inertia. It is the expression of the Supreme Consciousness. Sri Suktam says the 'Sign' (Lakshmi) of that Supreme consciousness is Sri. It is the Sri who manifests in all matter and beings as the Sign of that Supreme consciousness. Hence Sri is also depicted as one who springs from the navel of Hari or Vishnu. Thus the depiction of Sri as springing from navel of Hari is in the dimensions of Consciousness. The depiction of Brahma springing from the navel of Vishnu is the dimension of gross(stula) Science. In other words Vedas and Puranas integrate Science and Consciousness. Vishnu which means ‘ever-working’ is Inertia. Inertia is ever-working motion. Inertia is the property of Mass/Energy to resist changes in its state of motion. Thus Vishnu is both at continuous motion as well as at rest. Vishnu is potential in energy (at rest) as well as Kinetic in energy (in motion/movement). Vishnu is the Inertia that bears and controls the movement in energy. Since Skanda is the six types of energy, Vishnu the bearer of the potential and kinetic in energy, is called ‘Skanda Dhara’. The twelve names of Vishnu are in six pairs. Kesava-Narayana, Madhava-Govinda, Vishnu-Madhusudhana, Trivikrama-Vamana, Sridhara-Hrsikesa and Padmanabha-Damodara. These are the potential-kinetic pairs that manifest in 6 different ways. The six potential-kinetic pairs are Nuclear Potential-Kinetic, Electromagnetic potential-kinetic, Mechanical potential-kinetic, Chemical potential-kinetic, electric potential-kinetic and Thermal potential-kinetic. These six potential-kinetic pairs make/guide the evolution of Universe. These potentials are also present in our body. That's why our body is considered an exact representation of the Universe. Kesava-Narayana is the potential-kinetic pair of 'Expression'. It is the nuclear potential-kinetic pair that causes mass, which is the expression of Universe. The mass causes the gravity and hence Brahma is shown born from Narayana. In our body the part of expression is our 'mouth'. In Anga-Vandanam, when we say 'Kesava-Narayana' we move our thumb across our mouth. Madhava-Govinda is the potential-kinetic pair of 'Light'. It is the Electro-magnetic potential that manifests at a distance and causes evolution of matter and beings. If all the matter had been within that primordial fire at the source, evolution of intelligence would not have taken place. The matter goes farther from the source energy and yet receives its energy and wisdom through the conversion of EM potential to kinetic. Go-Vinda means on that seeks the 'Go' (wealth). In our body it is our eyes that receive larger amount of information and knowledge through reception of light. In Anga-Vandanam when we say 'Madhava-Govinda' we move our ring finger across our eyes. Vishnu-Madhusudana is the mechanical/motion potential-kinetic pair. This is the mechanical/motion potential-kinetic conversion that manifests everywhere visibly in the Universe. In our body it is symbolized by the 'movement' of our breadth. In Anga-Vandanam, when we say Vishnu-Madhusudana, we move our index finger across our nose. Trivikrama-Vamana is the set of three thermodynamic potential-kinetic pairs. There are three thermodynamic potentials that manifests in sub-atomic world, world of elements and world of biological beings. In the sub-atomic world (which is the Patala) heat energy manifests as Helmholtz free energy potential. In the world of elements/compounds (Earth) enthalpy manifests with pressure and volume. In the world of biological beings Gibbs free energy potential manifests as chemical potential. All biological beings are manifestations of not just the Chemical potential, but also the thermal potential and enthalpy. Hence in Anga-Vandanam, when we say trivikrama-vamana we move our little finger across our head touch the ear-lobes on either side. Sridhara-Hrsikesa is the Electric potential-kinetic pair. The potential of a point charge is Electric potential. Charge is the basis of every action in this Universe, notably even our consciousness. Hence it is the 'Sri-dhara' (holder of Sri or holder of 'Consciousness'). All our senses are perceptions are because of this Electric potential. Vedas claim that consciousness resides in the Heart. It is possible that some ultimate consciousness in brain is controlled by the Heart, through electric signals. In Anga-Vandanam when we say Sridhara-Hrsikesa we move our middle finger across our Heart. Padmanabha-Damodhara is the ultimate Internal energy potential-kinetic pair of thermodynamics. It is the energy to create a sysem. It is the energy that created this Universe with all its matter and beings. Padma-nabha means Lotus Navel or Supreme Consciousness (Padma on which Sri resides) from which everything is born (Nabha). In Anga-Vandanam, when we say Padmanabha-Damaodhara we move our hand from our Navel (Nabhi) to Top of the Head (Padma or Lotus Chakra). Keza or Kesa means stringed one. Hence it is used to represent hair. Kesari is the maned one (lions). Kezava is the one with stringed hair. Kezara is saffron (which is actually of the form of strings). Vishnu is the string (Quarks and Leptons), the first form of matter. Hence Vishnu is called Adi Kesava, which means the first stringed one. Science says "Nuclear potential energy is the potential energy of the particles inside an atomic nucleus. The nuclear particles are bound together by the strong nuclear force. Weak nuclear force provide the potential energy for certain kinds of radioactive decay, such as beta decay". Kesava represents this nuclear potential energy of forces like strong and weak force. of all things; he is the infinite; he is beyond that which is boundless; he is above all that is above; he exists as finite truth; he is the object of the Veda; the limit of elemental being; unappreciable by the senses; possessed of illimitable might. He is the cause of cause; the cause of the cause of cause; the cause of finite cause; and, in effects, he, both as every object and agent, preserves the universe. He is Brahma the lord; Brahma all beings; Brahma the progenitor of all beings; the imperishable. He is the undecaying, eternal, unborn Brahma, incapable of increase or diminution. Purushottama is the everlasting, uncreated, immutable, Brahma." '"Nuclear potential energy is beyond the boundary of all things; It is the infinite; it is beyond that which is boundless; it is above all that is above; it exists as finite truth; it is the object of the Knowledge; the limit of elemental being; unappreciable by the senses; possessed of illimitable might. It is the cause of cause; the cause of the cause of cause; the cause of finite cause; and, in effects, it, both as every object and agent, preserves the universe. It is Gravity the lord; Gravity all beings; Gravity the progenitor of all beings; the imperishable. It is the undecaying, eternal, unborn Gravity, incapable of increase or diminution. It is the everlasting, uncreated, immutable, Gravity." Science says "Gravity of atoms is caused by mass of the Nucleus. 99% of the mass of the nucleus comes from the Nuclear potential energy in nucleus". This is what Vishnu purana also says. In Vishnu Purana, Parasara tells Maitreya about Narayana "At the close of the past (or Padma) Kalpa, the divine Brahma, endowed with the quality of goodness, awoke from his night of sleep, and beheld the universe void. He, the supreme Narayana, the incomprehensible, the sovereign of all creatures, invested in the form of Brahma, the god without beginning, the creator of all things.... The waters are called NAra, because they were the offspring ot Nara (the supreme spirit) ; and, as, in them, his movement/progress (ayana) took place, he is thence named Narayana (he whose place of moving was the waters)." "At the close of the past (or Padma) Kalpa, the Gravity, endowed with the quality of goodness, awoke from its night of sleep, and beheld the universe void. He, the supreme Kinetic Energy, the incomprehensible, the sovereign of all creatures, invested in the form of Gravity, the god without beginning, the creator of all things..... The quantum particles are called NAra, because they were the offspring to Nara (the supreme spirit) ; and, as, in them, his movement/ progress took place, he is thence named NArAyana (he whose place of moving was the quantum particles)." From the above it is clear that Narayana is the one who causes the 'Movement'. What causes the movement is Kinetic Energy. Since it is the Kinetic energy of the quantum particles, it is the kinetic energy of the nucleus. Also, science too says Gravity was the first force to express in the Universal evolution. Science too says Kinetic energy manifested first in Gravity. Madhava and Govinda are potential and kinetic associated with Electro-magnetic energy. things, who is the same with the moon, the receptacle of ambrosia, drunk daily by the gods and progenitors; to him who is one with the sun, the cause of heat and cold and rain, who dissipates the gloom, and iluminates the sky with his radiance: to him who is one with earth, all-pervading, and the asylum of smell and other objects of sense, supporting the whole world by its solidity! We adore that form of the deity Hari which is water, the womb of the world, the seed of all living beings." Indeed science says 'theme' of every expression in this Universe from atoms to complex beings is electro-magnetism. The Primeval light is Electro-magnetism. It is indivisible with zero rest-mass and infinite with long range. It is the cause of heat, cold and rain. It dissipates gloom and illuminates sky with radiance. Sankara translates Madhava as one who possesses Ma. I translate it as one who possesses Madhu or inertia or in this case potential. Madhava is the EM potential, while Govinda is the kinetic part of EM. Vishnu means one that is active, worker, one that makes it to run or flow, all pervader, separator or dis-joiner etc.. Vishnu is interpreted as a 'causer' of motion at a macro-level. Science says Mechanical potential is the 'causer' motion at a macro-level. The potential to cause motion at macro-level is mechanical potential. The mechanical potential is caused by external forces such as Gravitation or internal forces such as 'elasticity'. If Narayana is motion in Quantum particles, Govinda is motion in Light, Madhusudhana refers to motion in macro objects. Madhusudana means destroyer of Madhu. Madhu means inertness or the potential. Those substance that caused inertness (Honey, liquor, sugar) were called Madhu. The destroyer of that inertness or potential is Kinetic. Hence Madhusudana is the mechanical kinetic energy. Vishnu Purana says "Madhusudana, whose essence is incomprehensible, in the forms of these is the author of the uninterrupted vicissitudes (alternations) of creation, preservation, and destruction. The alternations/changes all things are of four kinds: Naimittika, 'caused by external force'; Prakrtika, 'by its nature/internal/with no net external force acting'; Atyantika, 'Excessive alternations'; Nitya, 'continuous, repeated/perpetual alternations'." Reading Madhusudana as mechanical kinetic energy, it reads "Mechanical Kinetic energy whose essence is incomprehensible, is the author of the uninterrupted alternations of creation, preservation and destruction. The alternations are of four kinds. They are Reciprocating motion caused by external forces, Linear motion with no external force acting, Oscillations with excessive alternations and Rotational motion with continuous, repeated, perpetual alternations". This clearly establishes madhusudana is motion at macro level. According to Vishnu Purana, the example of physical motion for Naimittika is the dissolution of the Universe. It is caused by external force called the Supreme Consciousness. The Universe goes back and forth like a reciprocating motion, due to external consciousness acting on it. According to Vishnu Purana, the example of physical motion for Prakrtika is the dissolution of a substance into its elements. It happens even when there is no external force. It proceeds linearly from one stage to another, like a Linear motion. According to Vishnu Purana, the example of physical motion for Atyantika is the dissolution is complete absorption of one into another. It goes through excessive alternations like an oscillatory wave and gets merged into the destination substance. According to Vishnu Purana, the example of physical motion for Nitya is the cycle of constant birth and death of matter and beings. It is marked by continuous but repeated alternations like a rotational motion. Further Vishnu Purana says "In this manner, the mighty Vishnu, whose essence is the elements, abides in all bodies, and brings about production, existence, and dissolution"
Hence Vishnu is the 'abiding/residing' mechanical/motion potential of the Universe. While the mechanical potential is caused by external forces, chemical potential is caused by internal forces. Chemical potential by definition is the amount of energy that can be absorbed or released in a chemical reaction or during a phase transition. There are four thermodynamic potentials. They are Internal Energy, Enthalpy, Helmholtz free energy and free gibbs energy. Of these, the Internal energy is the Padmanabha. The three other energies are Enthalpy, Helmhotz free energy and free gibbs energy are the Tri-Vikrama. Thermodynamic potential is present in sub-nuclear particles like Quark-Gluon Plasma, photons and electrons as Helmhotz free energy (the thermal energy). Thermodynamic potential is present in solids, liquids and gases as Enthalpy. Thermodynamic potential is present in biological beings as Gibbs free energy or Chemical Potential. Thus thermodynamic potential rules across biological beings of earth, matter particles of space and the Patala of sub-atomic particles. Trivikrama means the Three-stepped one. Trivikrama is said to have taken one step for earth, one for sky and another Bali's head which goes to Patala. Vamana is the Kinetic or movement of this chemical potential. The kinetic caused by these potential is the shortest of all the movements but it spans across all domains. Moving an electric charge in an electric field requires or releases energy, U (Joules). The energy, U, is proportional to charge – just as the force is proportional to charge. Electric Potential, V is defined as energy per unit charge, q. V = U/q. It describes what would happen to a charge if it was placed in the electric field. This electrical potential is a property of the system of the surrounding charges. It has units of Joules/Coulomb, or Volts. In nuclear physics it is expressed in electron volts, which is the energy required to move an electron or proton through a potential of 1volt. Electric potential thus predicts and calculate energies to move charges. The energy needed to move a charge from one potential V1 to another, V2, is simply ΔU = q(V2 – V1). Thus we arrive at the principle of a charge having certain potential energy. This potential energy of a charge causes all the evolution of compounds and material wealth in this Universe. Hence this potential is the Sridhara. Sridhara means the Holder of Sri. Sri Suktam calls 'Sri' as 'Lakshmi' (which means sign) of the Hari. Hari is the Supreme consciousness. The sign of that Supreme consciousness that manifests in every matter and being is Lakshmi. In other words, Lakshmi is the consciousness that manifests in every matter and being as a sign of that Supreme Consciousness. This Lakshmi is called 'Sri'. That's how Lakshmi becomes indicator of wealth, materials, cows etc. What holds that sign of consciousness..? In every matter and being it is the potential energy of the Electric Charge, that creates/evolves chemical compounds, mixtures, biological beings. This is the Sridhara. In the advanced biological beings, when the charges move gaining or losing potential energy, it manifests as our senses and perceptions. Thus Hrsikesa is the Lord of our Senses. While the nuclear potential and kinetic energy are caused by strong/weak interactions and the movement of quarks in nucleus, the internal energy represents the total internal energy of a system. The internal energy is the total energy required to create an object or system. The internal potential energy includes all energies given by the mass of particles, by the chemical composition, i.e. the chemical energy stored in chemical bonds having the potential to undergo chemical reactions, the nuclear energy stored by the configuration of protons, neutrons, and other elementary particles in atomic nuclei, and the physical force fields within the system, such as due to internal induced electric or magnetic dipole moment, as well as the energy of deformation of solids (stress-strain). The ultimate internal potential energy from which every matter came is the Padmanabha. It is where the Supreme consciousness resides. Every matter and being has this internal potential energy in which the consciousness that reflects the Supreme consciousness resides. Padmanabha means Lotus navel. Lotus indicates the Sahasrar chakra, the Chakra on which the consciousness resides. Padmanabha means the navel in which the consciousness resides. That ultimate internal potential energy in which the supreme consciousness resides is the Padmanabha. Brahma, the Gravity is born from this total internal energy. Hence Brahma is called Nabhija. The internal kinetic energy of a system arises as the sum of the motions of all the system's particles (translations, rotations, vibrations), whether it be the motion of atoms, molecules, atomic nuclei, electrons, or other particles. The microscopic kinetic energy portion of the internal energy gives rise to the temperature of the system. Statistical mechanics relates the pseudo-random kinetic energy of individual particles to the mean kinetic energy of the entire ensemble of particles comprising a system. Furthermore it relates the mean microscopic kinetic energy to the macroscopically observed empirical property that is expressed as temperature of the system. This energy is often referred to as the thermal energy of a system, relating this energy, like the temperature, to the human experience of hot and cold. This thermal energy is referred to as Rohita in Vedas. Rohita is generally interpreted as Red, light-red etc. Atharva veda Book 13 Hymn 1 says 'Rohita establishes the heat and cold', 'Rohita stabilizes the heat and cold', 'From him the heat, the cold, the yajna was born'. What causes this Rohita, the thermal energy..? Vishnu Sahasranama says Damodara causes the thermal energy. I translate it in this way (not the usual way). Damodara causes (hetur) pouring out (viksaro)of the course (mArgo) thermal energy (rohito). Along with (saha) Damodarah bears the Universe (mahidaro) with great strength (mahabaho). Damodara provides the fastest (vegavan) unlimited food/energy (amitaasana). Science says 'Thermal energy' is caused by the 'Internal Kinetic Energy'. The Internal Kinetic energy bears the Universe and provides almost unlimited food or energy to matter. Hence it is the dAmodara. Damodara means one who controls (damo) the navel (dara). The navel here is the total internal energy which all systems and objects are made of. The internal kinetic energy is the one that controls/determines the addition and release of energy to any system or object. I can interpret the entire Vishnu Sahasranama in this light Vishnu being the Inertia in beings. This Inertia is the expression of the will of the Supreme Consciousness that exists behind all the evolution. Hence Vishnu is also the ‘Will’ of the Supreme consciousness. If we consider the fact that ‘we’ (our ego, our consciousness) is a product of the thought that supreme consciousness Advaita (Not two) is right. If we consider that the Supreme consciousness that evolves us resides in us in some form, Advaita (Not two) is right. However, if we consider the fact that the Supreme consciousness might be a totally different entity from the higher levels of intelligence and consciousness that we possess, Dvaita (Two) is right. Aditya Hrdayam says Brahma (Gravity) and Vishnu (Inertia) are the prajapatis of these six forms of energy that come out of Siva and thereby lead the evolution of Universe. (Esa Brahma Ca Vishnu Ca Shiva Skanda Prajapati). Since Vishnu is Inertia and Brahma is Gravity, Brahma is shown as springing from the navel of Vishnu. 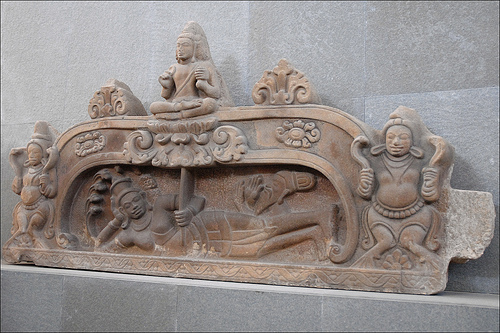 Vishnu is shown lying and spread across to show that Vishnu is Inertia (at rest). Brahma is shown arising from the navel to indicate that the Gravitational property of Mass/Energy arises from the center of combination of energy/mass all around, that are represented by their inertia.